Work to build the new viaduct over part of Borough Market is well in hand. The viaduct crossing Borough Market has been completed. The large new railway bridge, which will span Borough High Street, has been erected on top of that viaduct. It is resting on the metalwork of the viaduct (Image A) and will be pushed across the road using hydraulic rams. The new 1200 tonne railway bridge will be pushed into place on Saturday (30 April). The work will start at 6.00 pm and, if all goes to plan, it will be in place by 3.00 am the following morning (Sunday). The bridge will be pushed across the road, using hydraulic rams. It will slide on a Teflon (PTFE) layer, lubricated with Fairy Liquid! The other end of the bridge will be supported by multi-wheel low-loaders that will take the weight. When in position, the new railway bridge will run parallel to the old one (Image B). On the eastern side of Borough High Street, the supports for the new railway bridge are completed (Image C) but the rest of the viaduct at that end has yet to be built. After the railway bridge is completed, the remaining parts of the viaduct at either end will have to be built. The final task will be to lay new tracks across the viaduct and then join those tracks with the four existing tracks running west out of London Bridge Station. There will then be a total of six railway tracks, giving an increase of 50% capacity. IMAGE C: The two supports for the eastern end of the new railway bridge in the road called Railway Approach. Note: The text above this line was written on 21 April 2011 which was BEFORE the railway bridge was lifted into its final position. The problems being tackled by the building contractors in building the bridge and then moving it into place are formidable. The more exciting moments are highlighted in the text below. Passengers travelling west from London Bridge station currently enjoy observing, from the train, an exercise in how to thread a big, heavy railway viaduct through a maze of crumbling old Victorian buildings. The bridge consists of a plate girder on the north side, as this will be next to the bridge carrying the existing lines, and a truss to the south, as this will be visible to the public. Precast planks sit between these elements and are topped by an in situ reinforced concrete deck. The bridge is being built up in three stages; each time a section is finished the whole thing is moved along the viaduct so work can start on the subsequent section in the same location. The plate girder is supplied in six pieces so is simply bolted together, but the bridge is wider than the viaduct because the line will curve where it passes over the road. The work is taking place next to the live railway lines out of London Bridge and putting together the plate girder sections outside the line of the viaduct meant the crane would oversail the operational lines. 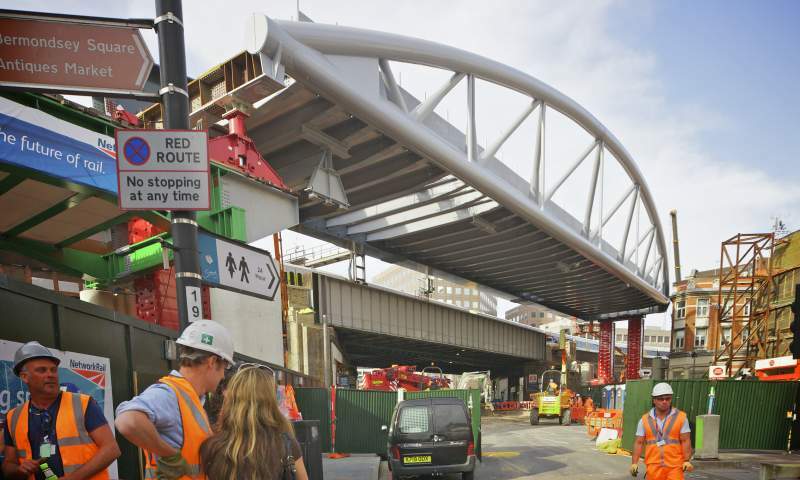 Because Skanska wanted to avoid costly and disruptive line closures it has assembled the plate girder over the viaduct and moved it outwards using two cherry pickers. The truss is supplied in modules that are welded together. Because of the amount of welding needed, a special enclosure to ensure comfortable working conditions for welders was erected over the bridge. This is also used for painting. “We call it the carwash because the bridge gets pushed through it,” laughs Fitzpatrick. On 30 April, the 1,200 tonne bridge will be ready for launch. Skid shoes will be located at the four corners of the bridge and integral jacks will lift the bridge up slightly to clear the temporary works. More jacks at the back of the bridge will slowly push it on the skid shoes along the viaduct. Wheeled transporters in Borough High Street will support the end of the bridge as it launches over the road. The bridge will then be rotated slightly – it had to be launched at a slight angle to clear a building next to the viaduct. The bridge is also 5m higher than the final position as it started life on top of the viaduct and to clear another building in its path. Once rotated, the bridge will be lowered into its final position. With the bridge in place the team still needs to link the new viaduct to the existing viaduct at the west end. A viaduct section on the east side of the bridge will also be constructed ready for connection to London Bridge station after 2012. The old market will be reinstated and demolished buildings replaced. The new viaduct deck will be waterproofed and left ready for the new lines and trains. Only then will passengers wondering what is going on outside the window of their train really appreciate what it was all for. IMAGE D: View looking north along Borough High Street (Sunday 1 May 2011). The new two-track bridge had been slid along the new viaduct so that it was beside the old four-track bridge. This picture was taken before the new bridge was lowered about five metres into its final position - onto the four concrete pillars that would be supporting its weight. It will be noticed that the far right-hand corner of the bridge appears to be very close to the red-brick building with white windows. In fact it lies within inches of the outside walls. The remarkable skill of the contractors in manoevering such an enormous object with such precision can only be marvelled at. Most of the text on this page was written on 21 April 2011. Since that date, the bridge has been lifted into its final position. The paragraph below (written on 4 May 2011) brings the story up to date. The positioning of the new bridge, which is 72 metres in length, was completed on schedule. The slide of the new bridge along the viaduct (into the position shown above) went according to plan. It was not lowered into its final resting position until Monday 2 May 2011. The site was handed back by the contractors late on Monday 2 May. The deadline to handing the site over was early on Tuesday 3 May. The image on the right shows the bridge in its final position, across Borough High Street. The new bridge was slid along the green viaduct, the weight of the protruding end was supported on a low-loader as it moved across the Borough High Street. When in position, the bridge had to be lowered five metres onto the four supports. The two western supports can be seen in both pictures. The two eastern supports are hidden by the old building on the far right of both pictures. The finials on the tower of Southwark Cathedral also appear in both images. On the right they are easily seen. On the left they can just be seen through the struts of new bridge. The more flamboyant style of the new bridge now conceals the rather ugly older railway bridge which dates from about 1864 when trains first started to travel west, through the high-level platforms of London Bridge Station, on their way to Cannon Street Station and Charing Cross Station.